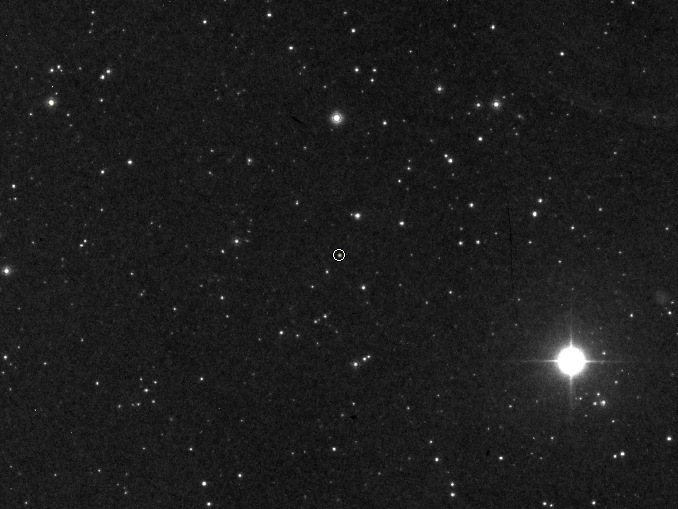 The visual magnitude +12.4 object circled at the centre of this Digitised Sky Survey image is a white dwarf known as van Maanen’s star that lies 13.9 light-years away in the constellation Pisces. 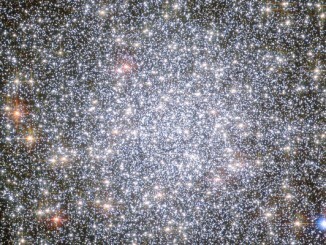 It is the closest known solitary white dwarf. Researchers have unearthed a photographic plate taken in 1917 at the Mount Wilson Observatory that shows a spectrum of the star (see below) containing the earliest recorded evidence of an exoplanetary system. Image credit: DSS. You can never predict what treasure might be hiding in your own basement. We didn’t know it a year ago, but it turns out that a 1917 image on an astronomical glass plate from our Carnegie Observatories’ collection shows the first-ever evidence of a planetary system beyond our own Sun. This unexpected find was recognised in the process of researching an article about planetary systems surrounding white dwarf stars in New Astronomy Reviews. Stellar spectra are recordings of the light emitted by distant stars. Spectra spread out all of the component colours of light, like a rainbow from a prism, and they can teach astronomers about a star’s chemical composition. They can also tell them how the light emitted by a star is affected by the chemistry of the things it passes through before reaching us on Earth. The 1917 photographic plate spectrum of van Maanen’s star from the Carnegie Observatories’ archive. The pull-out box shows the strong lines of the element calcium, which are surprisingly easy to see in the century old spectrum. 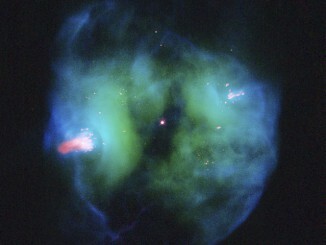 The spectrum is the thin, (mostly) dark line in the centre of the image. The broad dark lanes above and below are from lamps used to calibrate wavelength, and are contrast-enhanced in the box to highlight the two “missing” absorption bands in the star. Image credit: Carnegie Institution for Science. The clue was in what’s called an “absorption line” on the spectrum. Absorption lines indicate “missing pieces,” areas where the light coming from a star passed through something and had a particular colour of light absorbed by that substance. These lines indicate the chemical makeup of the interfering object. Carnegie’s 1917 spectrum of van Maanen’s star revealed the presence of heavier elements, such as calcium, magnesium, and iron, which should have long since disappeared into the star’s interior due to their weight. 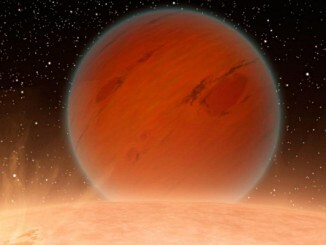 Only within the last 12 years has it become clear to astronomers that van Maanen’s star and other white dwarfs with heavy elements in their spectra represent a type of planetary system featuring vast rings of rocky planetary remnants that deposit debris into the stellar atmosphere. These recently discovered systems are called “polluted white dwarfs.” They were a surprise to astronomers, because white dwarfs are stars like our own Sun at the end of their lifetimes, so it was not at all expected that they would have leftover planetary material around them at that stage. Handwritten notes on the sleeve of the astronomical plate, made by observer Walter Adams, former Director of Mount Wilson Observatory. Image credit: Carnegie Institution for Science. Planets themselves have not yet been detected orbiting van Maanen’s star, nor around similar systems, but Farihi is confident it is only a matter of time. When a massive star ends its life in a spectacular supernova explosion, it can leave behind a rapidly spinning neutron star with a period of 1-10 milliseconds. Such objects that emit electromagnetic radiation in a lighthouse-like beam sweeping past the Earth are known as millisecond pulsars. CfA astronomers have identified white dwarf companions of two more millisecond pulsars in the spectacular globular cluster 47 Tucanae. A team of UK scientists and engineers announce plans to launch a small satellite called “Twinkle” within four years, an ambitious mission to provide insights into the chemistry, formation and evolution of planets orbiting other stars.